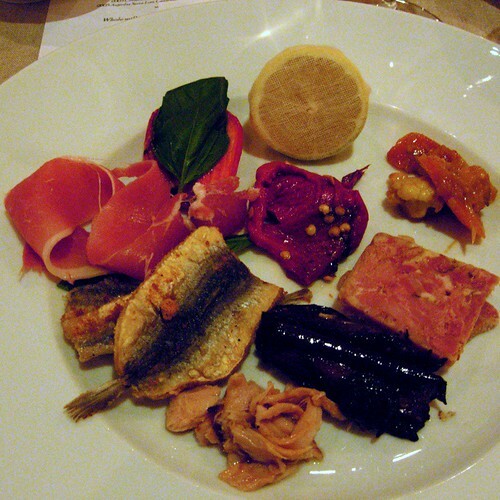 This is part of the 15th Melbourne Food and Wine Festival. 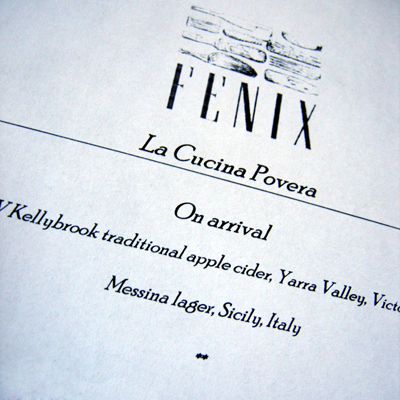 An event hosted at Fenix called La Cucina Povera. This dinner draws on a cuisine born of necessity, seasoned with the salt of the earth. 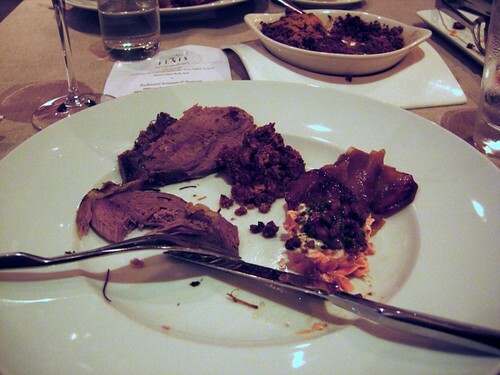 The flavours will be robust, the food shared and washed down by wines from some of the world's most famous peasant regions. 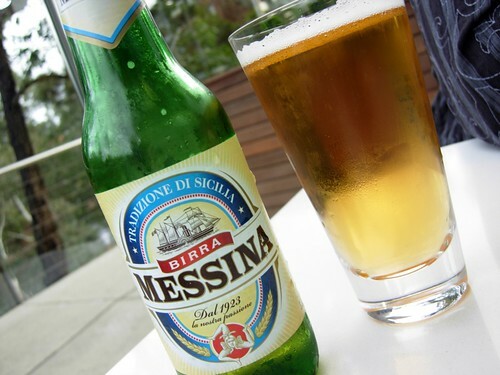 We began outside with a choice of Sicilian lager (Messina) or NV Kellybrook traditional apple Cider from the Yarra Valley. 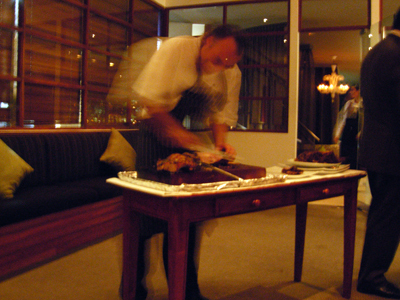 The dinner itself was held in one of the private dining rooms rather than the main dining room. To get into the mood, two large tables had been set and the room lit by candlelight. 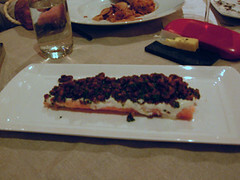 Unfortunately that meant that the photos aren't going to be that great but you should get an idea of what we had. It proved a simpler matter to photograph a plate with all the separate offerings than try to take a picture of each individual dish. 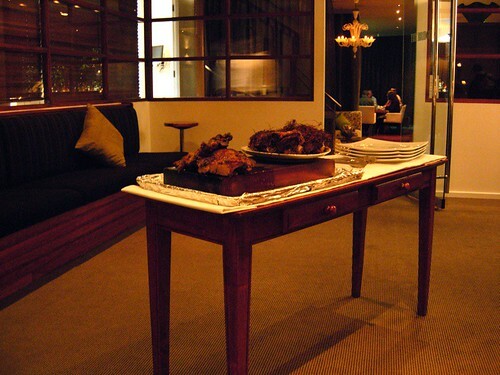 The lamb was brought out to the dining room, complete with remnants of hay. The salmon must have been slow cooked, it had lost none of it's vibrant colour and was coated in a mix of yoghurt and roasted walnuts. 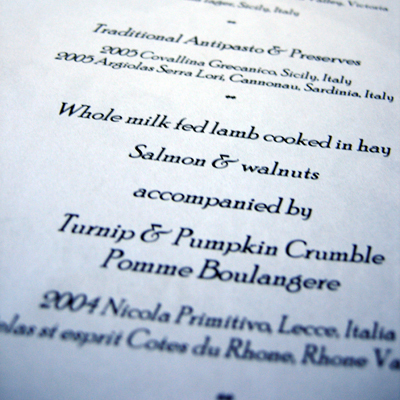 In the top corner there's a glimpse of the turnip and pumpkin crumble (wonderfully rich). 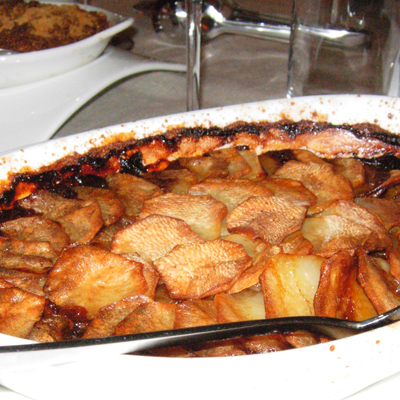 The Pomme Boulangere was super crispy on the top and underneath lay a generous amount of caramelised onions. 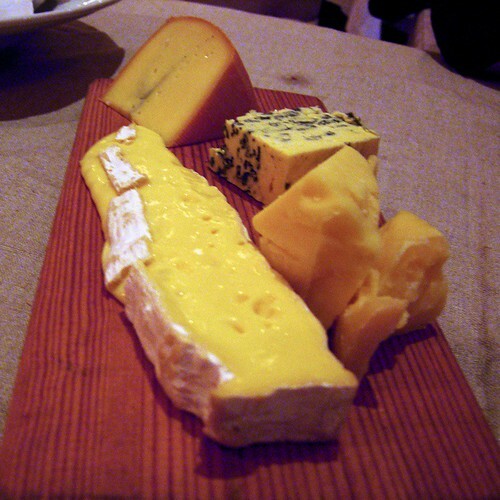 a melting Brie, chunks of Quickes cheddar, Roquefort and Morbier served with 2003 El Coto Tempranillo (Rioja, Spain).